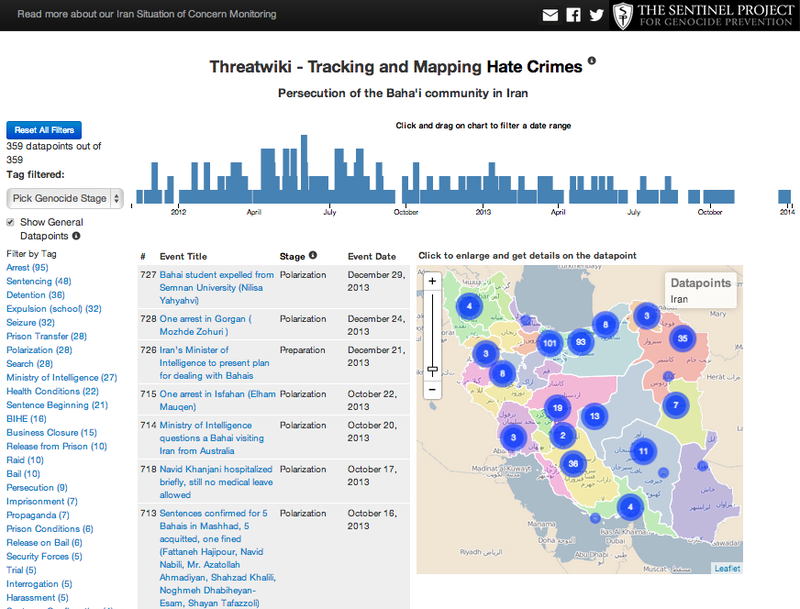 We are now ready to launch a visualization of the persecution against the Baha’i community in Iran, our longest standing situation of concern being monitored at The Sentinel Project. Since November we have been using ThreatWiki, a genocide risk tracking and visualization platform to help monitor communities at risk of genocide around the world. This tool is an integral part of our Early Warning System to help us identify communities at risk of genocide. What is Threatwiki’s role in identifying risk? Operational Process Monitoring is a continuous process of tracking events in a situation of concern (SOC) to identify event patterns and key actors involved. Events are classified according to the Stages of Genocide Model, which defines nine processes that underlie every historical instance of genocide. The events tracked in Threatwiki are indicators that help us assess the risk of genocide and help us see how far the genocidal process has progressed. For technical details of this data visualization project, take a look at Jerome’s blog for information on using D3.js, Leaflet.js and Crossfilter.